Plenary Lectures and Invited Papers. Gas-liquid-solid reactors for hydrogenation in fine chemicals synthesis (J.F. Jenck). Structure-reactivity in the hydrogenation of alkenes. Comparisons with reductions by diimide and the formation of a Ni(O) complex (S. Siegel). 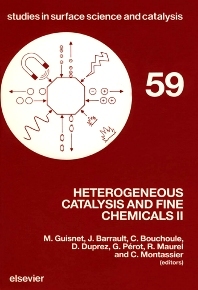 Heterogeneous catalytic oxidation and fine chemicals (R.A. Sheldon). Solids for catalysis and control in organic synthesis (K. Smith). Enantioselective catalysis by chiral solids: approaches and results (H.U. Blaser and M. Müller). Catalysis with immobilized enzymes: hydrolysis and esterification by Rhizopus arrhizus (C. Gancet). Research Papers. I. Hydrogenation and Related Reactions. (34 papers). II. Oxidation. (11 papers). III. Acid-Base Catalysis. (15 papers). The recession in the traditional heavy industries along with the development of advanced technologies in all the industrial countries has meant that the impact of heterogeneous catalysis in the synthesis of fine chemicals is becoming increasingly noticeable. The second International Symposium on Heterogeneous Catalysis and Fine Chemicals is to be seen in this perspective. Organised by the Laboratory of Catalysis in Organic Chemistry of the University of Poitiers within the framework of the International Symposia of the `Centre National de la Recherche Scientifique' (CNRS), the symposium provided an opportunity for contact between academic researchers and manufacturers, users (or potential users) of solid catalysts for fine chemical synthesis. The book gives an overall view of the problems encountered by academic and industrial researchers. A large variety of reactions are described, the emphasis being on selectivity: chemo-, regio-, stereoselectivity (even enantioselectivity) and on the change of these selectivities as a function of the characteristics of the surface sites (nature, distribution, etc.). The three themes of the symposium, hydrogenation, oxidation and acid-base catalysis were introduced in four plenary lectures and two invited communications, maintaining a balance between the industrial and the academic points of view. Some 60 research papers selected by the Scientific Committee were presented. All are reproduced in full in this proceedings volume.